The image is a crossed-polars thin section photo of a garnet pyroxenite nodule from the Bellsbank Kimberlite, South Africa. The high-birefringence (colored) mineral is clinopyroxene; the low birefringence (gray) mineral is orthopyroxene; and the extinct (black) mineral is garnet. The two-pyroxene-garnet intergrowth texture indicates that the entire nodule originally crystallized as a single phase, The only possible single-phase of this composition would be a majoritic garnet at pressures above 17 GPa or 500 km depth. Interestingly the nodule also contains sulfide blebs containing the mineral djerfisherite, a potassium nickel iron sulfide, which confirms the chalcophile nature of K at high pressure, consistent with K as the heat-generating element in the core. On-line free book: Smyth, J.R. and D.L. 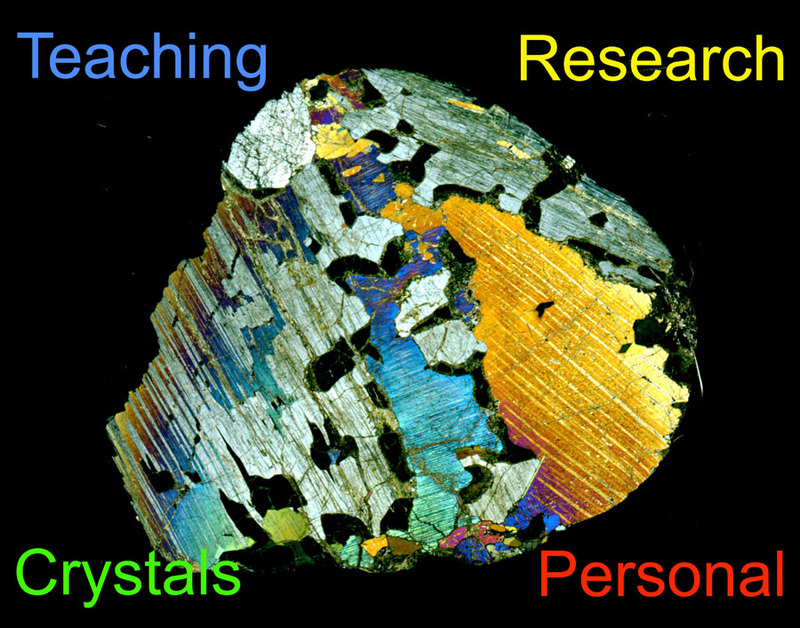 Bish (1988) Crystal structures and Cation Sites of the Rock-Forming Minerals. I last modified this site on September 7, 2015.